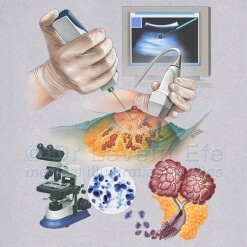 Surgical illustration narrating Breast reconstruction surgery procedure for women who have had all or part of a breast removed. The surgery rebuilds the breast mound with natural tissues. An artificial prosthesis, like a silicone implant may be added to provide symmetry and shape. 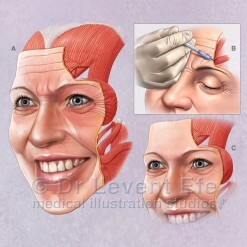 This medical illustration sequence help patients understand the difference between the two common types of this operation. Natural Tissue Breast Reconstruction is commonly done with the harvesting of either the Rectus abdominis muscle at the tummy, or the Latissimus dorsi muscle at the back. A full thickness graft of muscle, fat and skin are carried with their arteries and veins, which are reattached with microsurgery. 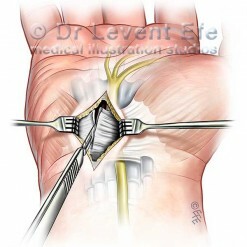 This surgical illustration series helps inform prospective patients the extent of muscle harvest, and all tissues that are involved in both types of the procedure. SKU: PAS09. Category: Plastic and Aesthetic Surgery (PAS). Tags: breast, breast_reconstruction, latissimus_dorsi, mammoplasty, mastectomy, muscle_flap, natural_tissue_breast_reconstruction, plastic_surgery, reconstruction, reconstructive_surgery, rectus_abdominis, rectus_flap.